I always used to find it difficult to write easy to understand product descriptions for the things I create. I recently came across a Mac app ClearText on Product Hunt. It allows you to write only using the top 1000 English words. It was simple and amazing but the problem is it only works on Macs. I cannot recommend it to my friends or my teammates who use a different operating system. One more problem I had with it is that it forces to remove uncommon words. I rather prefer a tool which encourages to use common words instead of enforcing it. I made a web based editor which allows you to write using the most common English words (I used the same word database used in ClearText). It highlights all the uncommon words in your text encouraging you to replace them with a commonly used word. It basically encourages you to write like Trump as compared to "V" in V for Vendetta. For example, use "beautiful" instead of "gorgeous", "stupid" instead of "imbecile" and so on. Check the GIF below to see it in action. anything else that you can think of. For example, if your product is designed for users all over the world, you must keep in mind that not everybody has English as their first language (like myself). If your product description uses complex vocabulary, many will find it difficult to understand and that may lead to less install/usage rate. I have friends who work in customer support. They encounter customers of various educational backgrounds. Some customers may find it difficult to understand simple (for most of us) things like browser and text editor. If someone cannot understand your instruction: "Open this link in a web browser and click on the cancel button", I recommend you use "Easy Write" and instead say "If you can see a "e" shape thing on your screen, click on it twice and and type www.somethingsomething.com and click on the red cancel button which you find at the bottom on the page". 😄 It may sound funny but it is not. It happens. I hope you liked it. It only supports English for now. I am planning to support more languages and features soon. I made a flashlight app for Android that actually works well and does'nt have any junk. Install it from Google Play Store and read this article to know why I made this app and how it differs from other similar apps in the market. This app turn ON the camera flash LED when you need. The app turns ON the flash LED as soon as you open the app and you can toggle it by clicking anywhere on the screen. Why is this made and how does this differ from other apps? There are many Android apps which are meant to do the same, but I personally did not like many of the apps which I tried. Most of them do more harm than good. So, I made one which works well and does not annoy. Most Android apps in this category do spy on you. I was wondering why so many apps need access to your contacts, calendar and lots of other information which is not required to run the app. The only reason they do that is to spy on you. They steal your contact information, caller ID, and other stuff which is a total fraud. Check this Android app in the screenshot above. 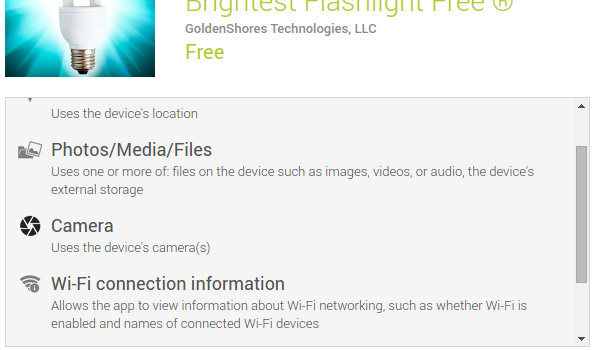 It is one of the top listed flashlight app in Google Play Store. It needs permission to access your photos, files, Wi-Fi information, Location, Caller ID and many more which is insane! This is just an example, but there are many other apps that ask for extra permissions. The app which I made just asks for access to Camera which is required by the Android API to operate the Flashlight LED. I made the toggle button to cover the entire screen so that you need not search for the button and instead just click anywhere on the screen to either turn ON or OFF. I hardly used any fancy animations or images in the UI. This makes it lightweight and probably faster too. A brighter screen consumes a lot more power than a darker one. So, I have purposefully kept most part of the screen dark to save battery power. The borders toggle between black and white indicating the LED status. I see many flashlight apps coming with too many unwanted features which are sometimes not even relevant to the app. Some of them are very heavyweight with all the unwanted junk. I tried to keep the functionality focused on just operating the flashlight well when you need. I found many Flashlight apps turn OFF after screen timeout. I tried to prevent that. It has no ads or other stuff that may annoy you. It just works. I like the Linux philosophy of do one thing and do it well. It does not run any background services so it does not affect your phone when you are not using the app. It is safe to install. It just took a couple of hours to make the first version of this app so I made it instead of searching for a better one from the thousands of apps in the play store. I have published it hoping that it will help you too. Try it and I will be glad to receive suggestions and feedback from you. You may download it from the Google Play Store. It is better to get a either a smartphone (I prefer Android and make sure it works in USA), a laptop or tablet when you come to USA. Otherwise buy one after you arrive. Most of these apps or services are recommended assuming that you have an easy access to internet and Wi-Fi connection. If you have a personal laptop or a PC, you can use Google Voice to make phone calls and SMS across the United States for free. There is also an Android app, but it works only if you have a mobile service. I mean to say that the Google Voice Android app does not work if you do not have a SIM card, but you can make calls from your computer/ laptop from Gmail. You can add a few bucks to your Google Voice account and use it for cheap international calling. There are many free calling apps for Android in the United States. I have tried many of them, but felt this was better than the flock. If you have a mobile device and do not have a SIM card or mobile service yet, this can come to your rescue. You will be assigned a number and you can call anyone in the US and receive calls for free. You just need WiFi connectivity for this to work. This website provides limited free calling to many countries. It provides free calling to India for a minute per day and for United States for about 3 minutes (at the time of writing this post). Although this does not sound a good alternative, it helps sometimes. I was using this to call my parents in India and ask them to come online on Skype. I used to use Google voice from my laptop for calling from the United States and used this website to notify my family or friends to appear online. Not yet popular, but Facebook messenger has recently added a feature to make voice calls. This is an awesome feature and can help you, call your friends anywhere in the world and that too without having a mobile number. However, to make a call the person on the other side should also have this app installed. The good thing is that most of the people in US have a smart phone, WiFi connection and this app installed. We may not have phone numbers of all our friends, but we have most of our friends on Facebook which makes this app very useful at times. There are many proxy calling services using which you can make cheap international calls. I hardly use these services as I go with Google Voice but most of my friends do. Most of my friends use indiald.com, telcan.com and other similar services to make cheap calls to India. You can give them a try if needed. There are many services which can help you find vacant houses around you. Here are the ones which I felt can help you out. This is an excellent app to find houses around you. It has both a web version and an Android app. The Android app can find houses round you based on your location. It marks vacant houses on a map and we can also search by distance from your location. But this app may not show all the vacant houses around. Its database was not that good at the time I used it. This is similar to Zillow. I hardly used this app, but many people and tech blogs recommend this. Also, it has better ratings on Google Play and seems to be more popular than Zillow. There can be many other houses not listed on these apps, so it is always a good idea to check by visiting local real estate agents. Most students and employees plan to live in a shared apartment after arriving in the US, at-least in the first few months unless you are rich enough. If you are sharing an apartment with your friends, you may have to split expenses among your roommates. This app does exactly that and simplifies a few complex calculations and saves a lot of time. SplitWise is a good service, but we had a bad experience with it. A few entries got modified or, deleted without our intervention. Mistakes in financial matters is not always a tolerable issue, so we planned to make a software of our own. I started coding it on a fine weekend in Python and we have replaced SplitWise with this for our in-house purposes. This uses entries from an excel sheet and does the calculations. I don't recommend you use it in the present state (at the time of writing this post) as it is not well documented and doesn't have a pretty interface. I will post it on my blog at all if I document it and make it user friendly. You can use the Google Maps Android app to easily find places around you like restaurants, gas stations, parks, offices, etc. In the current interface, if you click on the user icon on the right-top corner, you will be shown places around you in categories. You can also find user ratings to all the places. That's a very helpful feature if you are new to that place. I recently went to Seattle on a vacation to my sister's house and this app helped me a lot. Every day in the evening, I used to open this app and plan for my next days' trip. I've enjoyed a lot in this vacation and thanks to Google Maps. I have listed apps and services that I have used and felt are also be helpful to you. But that does not mean I am aware of all the wonderful apps and services. Let me and other readers know if you know any other good apps or services. That would be very helpful. Most of these apps may work for you everywhere independent of the location, but a few of them are relevant only for the United States. Some of my friends are coming to the USA to pursue their higher education and a few are coming on some job and some of you can be tourists. Whosoever you are, I hope this post helps. You must have come across causal and non-causal systems at some point in your Engineering life. Most of us might have simply studied that Causal systems are those systems which respond only to present and past inputs whereas Non-Causal systems can also respond to future inputs. That is correct but there is a lot more to explore about it. In this article we shall discuss the fundamental ideas and philosophies involved in this concept. I am not explaining the mathematics of causal systems here as they are readily found in any related text book and also on the Internet. You may refer to your text books any other source if you do not know what it is. Let us explore more on this. What is a causal system? A system is said to be causal if the output of the system depends only on past or present values of the inputs but not on future values of the inputs. 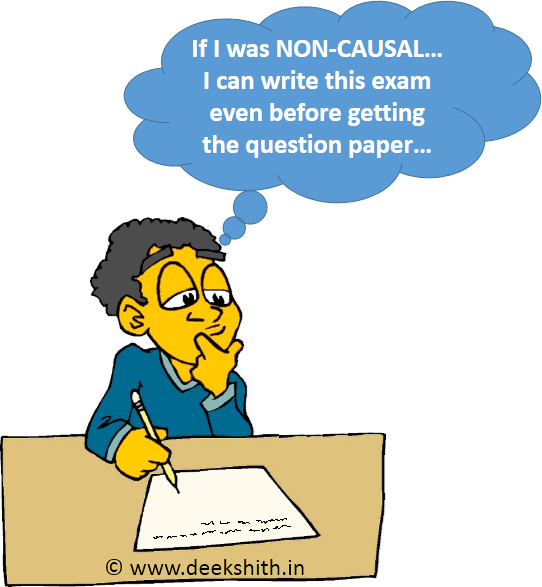 The term "causal" is derived from the word cause. The cause is anything that gives rise to an action, phenomenon or condition (according to English dictionary). By the meaning of cause, we can understand that cause is nothing but an input. So it is understood that a causal system is the one which responds to a cause. The cause is the input of the system and the response is the output of the system. That means, if a system produces an output only because of events (causes or inputs or excitations) that have happened in the past or happening now, such systems are called as causal systems. Causal systems are also called non-anticipative systems. Most (almost all) of the systems that we see in our daily life are all causal systems. Your mobile phone is a causal system because it rings only for the current call but it cannot ring for a call that may happen tomorrow. Examples are too many for causal systems because most of the systems that exist and that we see in our daily life fall into this category. Even we humans are causal systems. Our present actions (outputs) depend on the events (inputs) that have happened to us in the past and the events that are happening now but we cannot respond to events which will happen tomorrow. We may sometimes respond to events that we expect them to happen in future. But we can never respond to events that have happened in the future. Also, our expectation of the future is based on our past and present experiences. So, we are not that powerful enough to cross the borderline of causality. The concept of causality is as old as human civilisation. Many philosophies and theologies mention about the causal nature of humans and the universe. The karma siddantam discussed in the Santana Dharma (Indian philosophy) is one such theology. Alright, we shall restrict ourselves to our domain and stick to the topic. Causal systems are classified as having memory and memory less systems. Causal systems which can respond to causes in the past are all memory having causal systems. This is because, a system can remember causes in the past only if it has memory. Else, they are memory less systems. What is a Non-Causal System? A system whose present response depends on future values of the inputs is called as a non-causal system. There are two types of non causal systems namely, acausal and anti-causal. Acausal systems are those whose present response depends on future values as well as past and present values of the input. Anti-causal systems are those systems whose present output depends only on the future values of the input or excitation but not on the past and present values. Whenever we use the term non-causal, it implicitly means acausal in our discussion unless otherwise mentioned. Now comes the interesting part of the discussion. In the earlier section of causality, we have mentioned that almost all the physical systems that exist are causal in nature. A non-causal system gives an output to the inputs given to the system at some time in the future. It sounds crazy right? It is really hard to imagine any physical system that responds to future inputs. It seems something godly in nature which cannot be perceived easily. This is why non-causal systems usually do not exist physically in nature. They are not natural systems and are considered as virtual in most cases. When there is no physical system that is non-causal in nature, then why do we classify systems as causal and non-causal when they do not have any physical significance? Although non-causal systems hardly exist in nature, they can be made possible in virtual environments where we can define our own time axis (not the actual physical time). We can see that the system which we have defined gives the output of 4th second at the 1st second itself. Wonderful! As we have the right to write mathematical equations however we like irrespective of its physical existence, we can also make Non-Causal systems a mathematical reality. Alright, we have now understood that non-causal systems can be made possible on paper. But, can we make it really possible in our real world? The answer is YES! There is a possibility. Non-causal systems are possible when the system has recorded input and output data. Let me illustrate it with an example. Let us consider you as a system. Now you are watching a live cricket match. You are now a causal system because your feelings and emotions depend only on what happened in the past and what is happening at present. However, if you record it and watch the same cricket match later, you will know what will happen after some time in the match (because data of the match is already recorded in your mind). Now, your feelings and emotions concerning the match not only depends on the past and present events in the match but also depends on the future events of the match because you already know what happens. So, if we consider you as a system, the recorded cricket match as an input and your feelings as output and the time axis is fixed with respect to the recorded data as in the above example, then you are a NON-CAUSAL SYSTEM! Hurray! From the above illustration we can conclude that non-causal systems can be made possible when the system has knowledge of recorded values of input and output values and the time axis is taken in reference to the recorded data. People and books usually say that all physically realizable systems are causal in nature and non-causal systems do not exist naturally. That is true, this means that no system can be non-causal when it has no data about the future. So, to make a non-causal system possible, we have to provide future data to the system. As it is not really possible to do that naturally, we have to shift the time axis to the recorded data which is advance than the real time axis as we have done in the illustration above. Causality or non-causality is not just a mathematical representation but has quite deeper physical interpretations. Also, non-causality of a system is possible in some way or the other. That is why it is still present in the literature and we still speak of it.